Tuscanwise opens 2017 with a brilliant new collaboration with italian chef and foodblogger Stefania Fermi. Stefania is a passionate connesseur of traditional and regional italian cuisine, specialized in healthy and natural food. Antonio Scaccio, Dolce & Gabbana’s personal chef, has been one of her mentors in vegetarian and vegan cuisine. Her unique style gets you in an unforgettable experience. You can visit her blog www.fattoincasaconstile.it (homemade with style) in the english version. Join Anita and Stefania in this brand new itinerary: A travel foodie's dream to tuscan wellness and lifestyle. Mindfulness and hiking with Kaira Jewel Lingo and Anita Constantini. 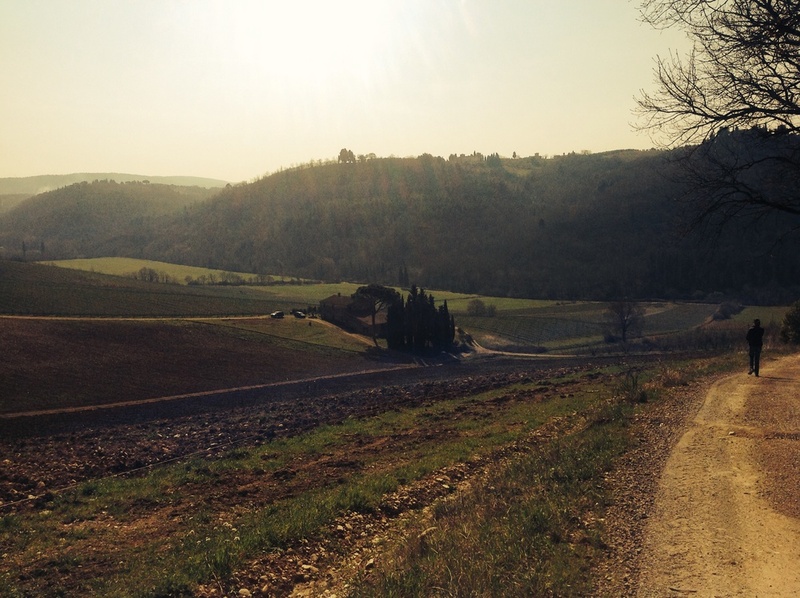 The solar eclipse and spring equinox welcomed us today for a walk on the grounds of the estate of Villa Le Corti, in San Casciano Val di Pesa. The Princes Corsini, owners of Le Corti, exemplify Tuscan care for the land. Their heartfelt commitment comes down to simple daily gestures, as I could observe and appreciate in our meeting with Clotilde Corsini. Our scenic walk through the vineyards passes several of the estate’s poderi- old farmer’s houses- down to the river and back up the hill in the bush, past olive groves to the Villa. The vines are now organicly grown. Alternate rows are sowed with field beans to keep the natural balance of the soil, creating green and brown stripes through the landscape. You can discover more about the villa at www.principecorsini.com although you need to be there to experience, at the end of the walk, a pleasant winetasting and light lunch in the old cellars. Sobre and refined. In Renaissance’s cradle even ice cream can take on a historical perspective. Florentine ice-cream makers honored the 500 years old bestseller “the Prince” by Machiavelli, Florentine diplomat and political theorist. Their delicious creation was elaborated using ingredients typical of the XV century: a milk cream base flavored with sage, cardamon and the aromatic liquor Alkermes. You can taste the Prince’s flavor at the gelateria Perchè no!, in via dei Tavolini, Firenze. Where there is great will there cannot be great difficulties.